Rose Blake’s exhibition, Sing Swim OK Moon, is simply an extra-ordinary exhibition in the sense that its artist adds an extra to the ordinariness of life. Inspired by the ‘Horn OK Please’ (a phrase commonly found on the back of vehicles in India) Blake’s exhibition consists of artworks, each dedicated to one of the four keywords of ‘sing’, ‘swim’, ‘ok’, and ‘moon’, which are repeated for ten times throughout the gallery. Ms Blake has designed each work digitally before screen printing them on silk and sending them to Mumbai for fine, vibrant embroidery and beadwork. The hybridity of Blake’s artistic production is inspired by the multifarity of life, with an adoration for simplicity as a concept that brings peace to chaos. 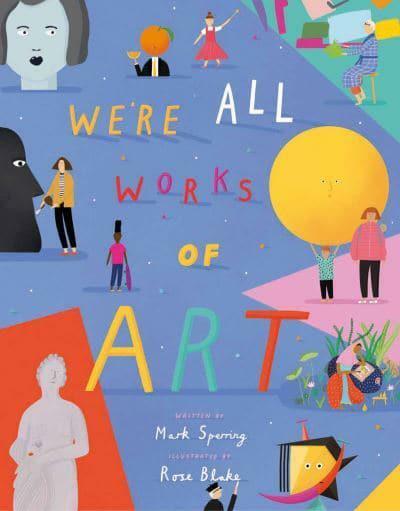 The artist’s appreciation for the diverse multiverse has always been present throughout her career, but this appreciation is most palpable in Blake’s saraband of sketches in the book titled We’re All Works of Art, in which, together with Mark Sperring, Blake transforms the works of many canonised artists into templates for her fête of diversity and identity. The London-based artist’s choice of four words and their repetition is more calculated than one might imagine. The two activities (singing and swimming), the one thought/state (being okay), and the one object (the moon) are all essentially positive and life supporting, but most importantly, relaxing and stable. It is in this sense that one can certainly see Blake’s artworks as depicting and promoting “self-care”—a notion that art must come to unconditionally endorse and promote for the benefit of viewers and artists. The celebration of being OK is the pivotal message of this exhibition. In these political times of instability, when individuals (especially the young, female ones) are faced with societal pressures propagated by the media and the arts, with the everyday grind and wear of work, and the vile prevalence of hateful, exclusive and threatening messages on social media (which were supposed to be a refuge for our generation), the need for self-care is felt ever more urgently. Blake’s message of self-care is not an idyllic escape from the urban landscape, but an additional layer to it, which simply enhances the quality of life. The repetition of these four positive words, animated over serene colours, landscapes, and shapes, takes the form of an incantation: an incantation worthy of ritualistic reiteration and replication. In addition, Blake’s employment of embroidery in this exhibition is quintessentially apt, not only for making the artist’s concept tangible, but also for the well-established and positive connection between embroidery and relieving stress. Rose Blake does not promise hope or ecstatic sensations, but via-media, sustainable relaxation—a project of good-will, a message of looking after one’s self. In this sense Blake promotes a refinition of carpe diem which would occupy the mind of the viewer and would drive them towards accessible activities (swimming, singing), positive mindsets (feeling ok), and mindful appreciation of surrounding objects (such as the moon). And any variation and rearrangement of these activity-concepts would do! The invitation, Sing Swim OK Moon, is so powerful that when the works are taken into different homes, they still issue a mesmerising suggestion for enhancing one’s own life. The festive, eruptive projections in the ‘Sing’ series capture the joy of self-expression. The dominance of azure colour in the ‘Swim’ artworks, together with the occasional use of sequins as waves, truly depicts the calming quality of emerging activities. One technique that Blake seems to be very fond of, is seizing the visual essence of the environment (such as the swimming lane ropes), and two-dimensionalising it into geometrical forms, as most manifest in her Swim (Harry’s Lane) [pictured below]. The ‘OK’ artworks arrive at serenity via ambiguity. One has to look hard to understand what is expressed there, but then, this is perhaps the very point of self-care in the face of anxiety and confusion. It is the mindset of okayness, with its oozing colours, which seeps through each work and makes them perfectly ‘OK’. And lastly, the simplicity of the ‘Moon’ works encapsulates mindfulness and inner peace. These prescient details have contributed to the central message that Blake so gently and smoothly brings home. Rose Blake’s exhibition was hosted and promoted by the Rebecca Hossack Art Gallery, Charlotte Street branch. Rebecca Hossack, widely known for her commitment to diversity in arts, this time rightly has aimed for well-being and positivity. This particular branch is cosy and welcoming. And during the summer, the mixture of sunlight and the cool breeze is a desirable bonus. Click here for their Instagram page. * images taken and reproduced by kind permission of the gallery.